WHAT A WEEK! Has anyone else had their busy-ness put into overdrive lately? Between the end of McKenna’s softball season activities plus the games, my work encounters with crazy humans, family shiiii…stuff, and my normal wife/mother job duties…oh did I mention BOTH my dogs got sprayed by a skunk? I love my life, but this week I feel more inclined to fix myself a Big Gulp-sized cocktail rather than dinner. It happens to all of us. It’s been a long day/week and I feel like a toddler who is screaming “I AM NOT TIRED!” while rubbing his eyes. We all have these days. I LOVE to cook but there are definitely times when I want to be in and out of the kitchen ASAP so I can get on with my day. This is one of those times. I have those thoughts of picking up take out or going through the drive through. I think of grabbing some canned ravioli or something and being done with it. But I know if I do I am not going to feel any better. Not only will I not be giving myself or my family the nourishment we need, but I will be serving a whole bunch of chemicals and hormones we don’t need! And it definitely won’t taste as good! Thankfully, simple, fast and easy does not eliminate REAL food. I am so grateful I can still make a healthy and delicious meal for my family with the minimal effort I have to give right now. And it will take less than half an hour! 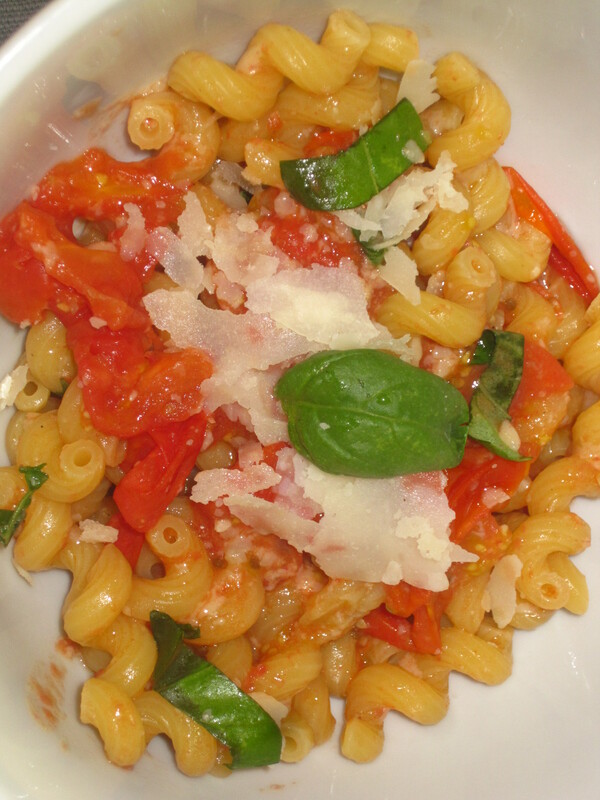 This is my Simple Tomato Basil Pasta. The biggest difference between this and most tomato sauces is that it is from fresh tomatoes. It only has 6 ingredients including salt. This sauce bursts with freshness. It’s like a bowl of sunshine and comfort. The grape tomatoes add freshness and that soothing tomato-sauce feeling. The basil is like adding holiday lights to a house – the green brightens up the whole dish in appearance and flavor. I’m tired and hungry, are you? Let’s do this so we can EAT! Pick whatever kind of pasta you like. I have been kind of into ancient grain pasta lately but this time I went with regular semolina. I know whole wheat pasta is all the rage right now and it is probably healthier. I am just of the school that we eat far too much wheat in this country so I try not to go overboard. Just make sure it’s quality whatever your preference. I prefer these to the cherry ones. They are sweeter, juicier and the seeds are MUCH less bitter. But if you like cherry ones go for it. Or if you have any kind lying around feel free to use them. Mix them up if you have more than one type. Heirlooms would be fantastic. If you are using large tomatoes I would use about 5 – 8 depending on size. Parsley would be a good sub for this too. You can also sub chicken stock or even water. Fill a large pot with water and bring to a rolling boil on high. We need this to be really boiling. When there are just a couple of bubbles, it is not the time to add the pasta. Begin by slicing the tomatoes in half. Drizzle olive oil into large skillet and raise heat to medium to medium-high. Drop in tomatoes. Sprinkle in a pinch of kosher salt. Smash, peel & chop garlic. Toss in with tomatoes. Let it cook about 5 minutes. Add vegetable stock, let it come to a boil and then lower heat. To easily peel garlic just lie your knife flat on top of it with the blade facing away from you. Then with the heel of your palm, smack the flat part of the knife. This will make the peel come right off. It will also smash the clove, opening it up to release all that garlicky goodness, giving you a head start on the mince. Just be sure to use some type of chopping knife, not a small one, and be careful! Once you get the hang of it, it’ll be easy. I just give a rough chop to the garlic in this recipe. If you want more garlic flavor then mince it up finer and/or add more cloves. The stock is just adding some flavor and also aiding the tomatoes in cooking down. When water in pot is boiling, drop in a fistful of salt and add the pasta. Give it a quick stir. Cook 8 to 10 minutes until al dente. Yes, a fistful. You have a pound of pasta that will need that salt to cook and flavor it. Al dente means the pasta is soft but it still slightly toothsome (slight bite). That quick stir right when you pour it in will help it release its starches. Don’t add oil to the water. It will keep your sauce from sticking to the pasta. With the back of a fork, smash the tomatoes. This is just making sure all that pulp becomes the sauce. When pasta is cooked, ladle about ¼ of a cup of the pasta water into the sauce. Drain the pasta and also add to sauce. Toss and leave on medium-low for another couple of minutes. The pasta water has all those starches from the noodles. This will help bring the sauce together and thicken it slightly, which is good because this is a thin, light sauce. We are letting it continue to cook because the pasta will keep cooking and absorb some of the sauce, infusing it with flavor. Chop up the basil and garnish. I sometimes leave the leaves whole. It looks so pretty! Parmesano Reggianno cheese or even some fresh mozzarella are awesome toppers. I love this recipe. It just tastes like summer! It takes less than half an hour and is so delicious. I hope you give it a try! And I haven’t forgotten about my drink… Some pino griggio goes fabulously with this pasta! Here’s my weekly recipe post for my friend Adria’s amazing blog Eating For Our Future! Check it out & lurk around her other posts – she’s got some amazing ideas & insights!